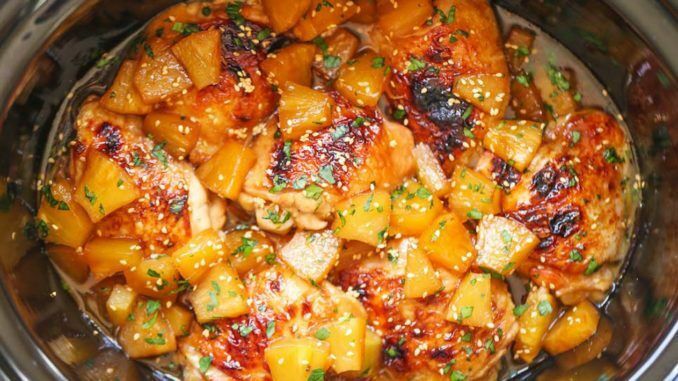 In a large bowl, combine pineapple juice, chicken broth, brown sugar, soy sauce and garlic. Place chicken thighs into a 6-qt slow cooker. Stir in pineapple juice mixture. Top with pineapple chunks and reserved juices. Cover and cook on low heat for 5-6 hours or high for 2-3 hours, basting every few hours. In a small bowl, whisk together 1/4 cup water and cornstarch. Stir in mixture into the slow cooker. Cover and cook on high heat for an additional 30 minutes, or until sauce is thickened. OPTIONAL: Preheat oven to broil. Place chicken thighs onto a baking sheet, skin side up, and broil until crisp, about 3-4 minutes. Serve chicken immediately, garnished with sesame seeds and parsley, if desired.